Thanks to everyone who made our #GivingTuesday Charitybuzz auction a success. As 2015 draws to a close, we're happy to announce that our #GivingTuesday Charitybuzz auction raised enough money to send 20 extra children to sleep-away camp next year. With your support, we can reach our original goal of 25 children. Click here to donate now to help us send five more children to sleep-away camp. Remember, if you pledge before December 31, your donation will be tax-deductible for this year. A good time was had by all at our second annual Camp Brooklyn After Dark event. New friends and old joined us at the Sanctuary Hotel's elegant Tender Lounge on Tuesday night to show their support for Camp Brooklyn. Thank you to all of those that bought tickets to the event and made donations. Your contributions are invaluable to our mission of giving low-income Brooklyn children the chance to attend sleep-away camp. If you couldn't make it to the event, you can still donate by visiting here. Click here to view photos. 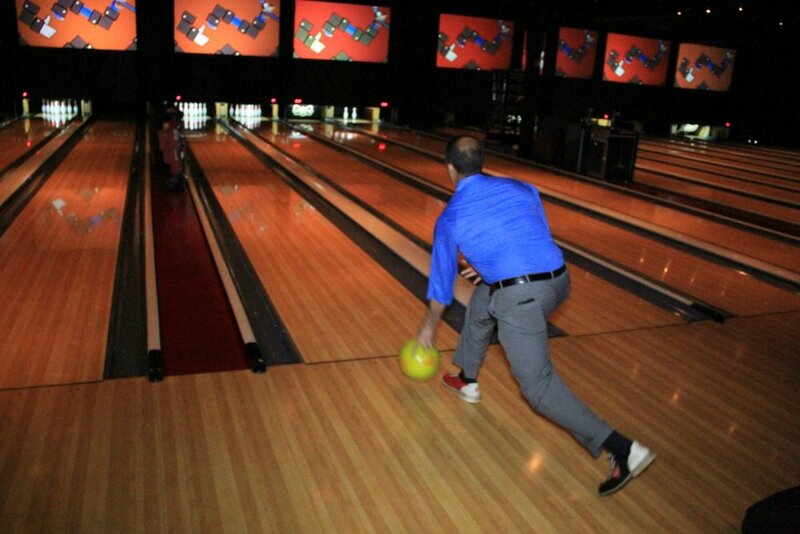 On Monday, June 22nd, friends of Camp Brooklyn bowled the night away at Brooklyn Bowl's state of the art bowling lanes. Brooklyn Bowl provided tasty food made to perfection by Blue Ribbon: fried chicken, green salad and mac & cheese. Bowlers also enjoyed live music and the incredible ambience of Brooklyn Bowl, which Rolling Stone magazine called “one of the most incredible places on Earth.” Camp Brooklyn greatly appreciates the support of everyone who came out to the event and also those who donated. Thanks to you, we’ll be able to send even more kids to sleep-away camp this summer! On Thursday night, supporters of Camp Brooklyn gathered in Marco Polo Ristorante for a lovely evening of Italian wine and savories. Many thanks to Marco and Joe Chirico for hosting the event in their iconic restaurant, and providing a buffet of artfully-prepared delicacies. Thanks also to the distributors that generously provided the evening's exquisite wine selection: Palm Bay Wines, PW Distributors, and Vin Divino. Camp Brooklyn greatly appreciates the support of everyone who attended the wine tasting, and those who donated. Thanks to your generosity camp Brooklyn will be able to send more low income Brooklyn children to sleep away camp this summer. Thank you to all of our supporters for making our annual Camp Brooklyn Community Service Award Gala on October 23rd at the 40/40 Club by American Express at Barclays Center a big success! It was a pleasure to honor two people who have done so much for Brooklyn and the community: our founder Marty Markowitz and Gina Argento, President of Broadway Stages. 200 guests joined us for this wonderful celebration, helping us to send even more children to camp in 2015! March 13th was a wonderful night filled with great food in a great space, exciting auction items and old and new friends as we honored Bruce Ratner, Chairman and CEO of Forest City Ratner Companies, and Peter Meyer, President of TD Bank's New York City Market, for their outstanding philanthropic endeavors and commitment to the community, at the 40/40 CLUB & Restaurant by American Express at Barclays Center. We are thrilled to report that through their tremendous efforts as well as all those who contributed, we have raised enough money, from this event alone, to send over 150 low-income Brooklyn kids to accredited sleep-away camps this summer for an experience they'll never forget. Camp Brooklyn Fund was delighted to honor several outstanding members of our community at the Annual Chinese New Year Celebration on Tuesday, February 7th at New Spring Garden Restaurant in Brooklyn's Chinatown. Evening host, Brooklyn Borough President Marty Markowitz, presented the awards to: Kenneth D. Daly, National Grid, Deon Levingston, WBLS/WLIB, Michael "Buzzy" O'Keefe, and Yvonne Riley-Tepie, TD Bank. Thanks to the more than 400 guests in attendance, we will be sending close to 100 more kids to sleep away camp this summer. Camp Brooklyn was delighted to honor several outstanding members of our community including: Gary B. Flom, President and CEO, Bay Ridge Ford; George Hulse, Vice President of External Affairs, Healthfirst; Community Leader Allan F. Kramer, II, and Irene LoRe, Executive Director, Park Slope 5th Avenue BID, at the Annual Chinese New Year Celebration on Tuesday, February 7th at New Spring Garden Restaurant in Brooklyn's Chinatown. Thanks to the more than 400 guests in attendance, we will be sending over 100 more kids to sleep away camp this summer. November 16, 2011 - 22nd Anniversary Mickey Mantle's Community Service Award presented to Filmmaker Darren Aronofsky and Thomas Canty, of Empire BlueCross BlueShield. The funds raised from the evening will enable Camp Brooklyn Fund to send over 170 kids to sleep-away camp in 2012. Special thanks to our major sponsors, including: 777 Management Corp., Apple-Metro, Inc., Barclays Capital, Broadway Stages Ltd, Brooklyn Cyclones, Citibank, Emblem Health, Empire BlueCross BlueShield, IZOD, Lois A. Jackson, DDS & Associates, Steamfitters Industry / 100 Who Care, and TD Bank. We had over 100 items up for bid in the Silent, Live and On-Line auctions as well as 60 raffle items. Click here to view photos from the event. Over 500 friends came together at New Spring Garden Restaurant to enjoy an authentic traditional multi-course Chinese banquet with entertainment at this sell-out event in Brooklyn's Chinatown to celebrate the Year of the Rabbit. We were so delighted to honor five great community leaders, Bernard J. (BJ) Duffy, Market President, Brooklyn & Staten Island Senior Director, NE Market Operations for Capital One Bank; Colvin W. Grannum, President of Bedford Stuyvesant Restoration Corporation; Ilene D. Margolin, Senior Vice President Public Affairs & Communications for EmblemHealth, Inc.; and Charley Ryan & Peter Shapiro, Founders of Brooklyn Bowl. The crowd was entertained by Traditional Chinese Dancers from the Taiyuan, China Acrobatic Dance Troupe, two children's performances from the Brooklyn Chinese America Association and PS 105, and soloists Arthur Lai and Zheng Ying Tin. November 16, 2010 - 21st Anniversary Mickey Mantle's Community Service Award presented to Rosanna Scotto, co-host of Good Day New York and Byron Lewis, CEO of UniWorld Group. The funds raised from the evening will enable Camp Brooklyn Fund to send over 140 kids to sleep-away camp in 2011. Special thanks to our major sponsors, including: 777 Management Corp., Apple-Metro, Inc., Barclays Capital, BET, Broadway Stages Ltd, Brooklyn Cyclones, Citibank, Emblem Health, Empire Blue Cross Blue Shield, Federal Law Enforcement Foundation, Lois A. Jackson, DDS & Associates, Phillips-Van Heusen, Preferred Health Partners, TD Bank, UniWorld Group, Inc. We had over 100 items up for bid in the Silent, Live and On-Line auctions as well as 60 raffle items. Over 50 campers joined Brooklyn Borough President Marty Markowitz on the steps of Borough Hall for an afternoon press conference. After announcing that Camp Brooklyn Fund will be sending 400 Brooklyn kids to camp we were all treated to an original song performed by two of the campers. Brooklyn Cyclones mascot, Sandy The Seagull, made a special appearance to meet the kids and hand out tickets to a 2010 Brooklyn Cyclones baseball game. We thank the Cyclones for making Camp Brooklyn the beneficiary of their YOUINFORM Jersey Design Contest. Special thanks to BJ Duffy, Brooklyn Market President, Capital One Bank for their major support and to Applebee's for providing the Applebee's Grab 'n Go Box Lunch for our participating kids and their families and caregivers. We were also proud to welcome Charley Ryan, Founder of Brooklyn Bowl as our newest partner. 100 friends boarded Cunard's Flagship and World's Grandest Ocean Liner, the Queen Mary 2, for a Private Reception and Luncheon honoring the 100th Anniversary of the Brooklyn Heights Association and to benefit Camp Brooklyn Fund. 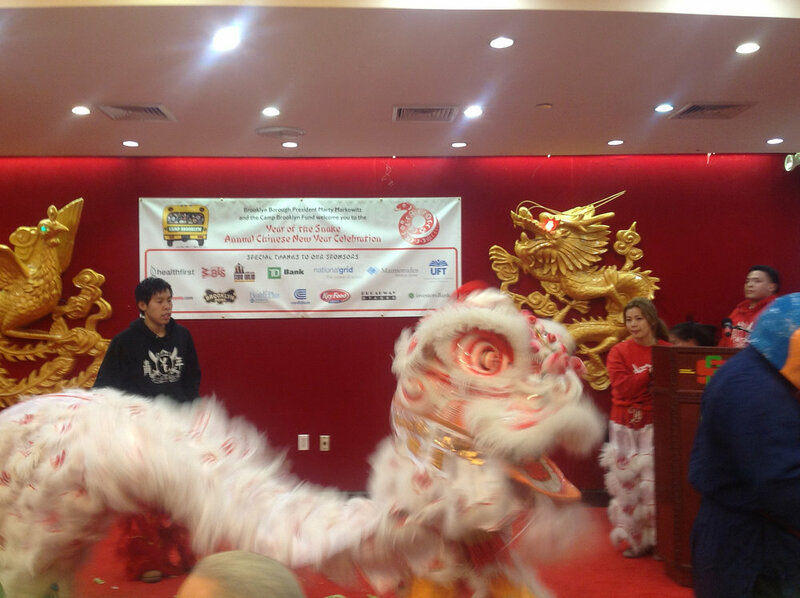 Over 550 friends came together at New Spring Garden Restaurant to enjoy a multi-course Chinese banquet with authentic Chinese New Year entertainment at this sell-out event in Brooklyn's Chinatown to celebrate the Year of the Tiger. We were delighted to have the opportunity to honor Tom Newell of Con Edison, Ulysses Kilgore of Bedford-Stuyvesant Family Health Center. Click here to view photos. 20th Anniversary Mickey Mantle's Community Service Award presented to acclaimed film director and actor, Spike Lee and Denise Arbesu, Group Vice-President for Citibank, N.A. The funds raised from the evening enabled Camp Brooklyn Fund to send 125 additional kids to sleep-away camp in 2010. Special thanks to our major sponsors, including: 777 Management Corp., Apple-Metro, Inc., Barclays Capital, Citibank, DCM Construction, Emblem Health, JetBlue Airways, Lois A. Jackson, DDS & Associates, Medgar Evers College, MetroPlus Health Plan, Phillips-Van Heusen, Preferred Health Partners, Sotheby's Realty/Karen Heyman, TD Bank and Verizon. We had over 100 items up for bid in the Silent, Live and On-Line auctions as well as 50 raffle items.